Denia Classics 2019 - serie of 4 concertsPromociones Denia, inmuebles en venta en la Costa Blanca con especial enfoque en La Sella Golf Resort, Denia. The concert serie Dénia Classics, presented by the association Konzertfreunde Costa Blanca is already a firm part of the cultural agenda of Denia. From Chicago and New York songs from Glen Miller, Benny Goodman, Count Basie, Louis Armstrong, Duke Ellington, presented by the Marina SI-FA-SOL Bigband on Friday 25 January. The second concert on Friday 22 February with Yvonne Timoianu, violoncello and Alexander Preda, piano forming the Salzburg Duo, playing exclusively pieces from Mozart as the Wolferl-Suite, Haffner-Serenade y Suite Papageno. On Friday 29 March the pianist Claudio Carbó will delight with pieces from Beethoven, Chopin, Schumann, Liszt andGranados. 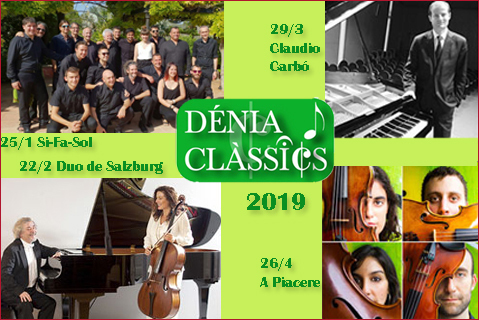 Dénia Clàssics 2019 will be closing on Friday 26 April with the String Quartet “A Piacere” formed by Ana Requena, violin, Miguel Ängel López, violin, Miguel Falomir, viola and Yolanda Bueso, violonchelo. Vienesse musik from two centuries with pieces from Haydn, Mozart, Strauss and Verdi.